Two young Ocean Grove surfing grommets soaked up the term 2 school holidays this month with a surf adventure of a lifetime on Australia’s east coast. 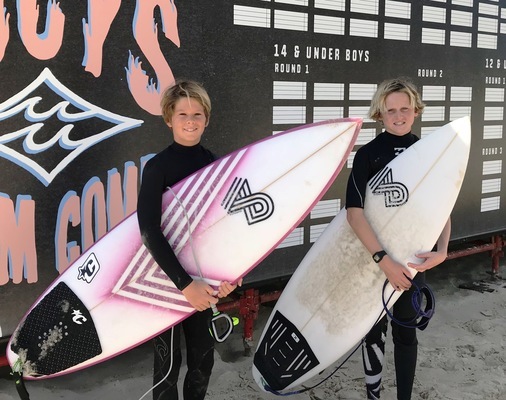 Star local surfers Charlie Mahoney, 14, and Jack Bassett, 12, won an invitation to compete at the prized Billabong Occy’s Grom Comp at Duranbah, the most northern surf break in New South Wales. The Occy’s Grom Comp named in honour of 1999 World Surfing Champion Mark ‘Occy’ Occhilupo, is considered one of the premier junior surf titles in Australia. The annual event is internationally renowned and attracts elite junior surfers from around Australia and the world’s best young talent from South Africa, Brazil, Japan, USA, New Zealand and Tahiti. Jack made the quarter finals of the 12 and Under Boys competition before he was eliminated, while Charlie was knocked out in Round 2 of the 14 and Under Boys category. Prior to the 7-12 July Occy’s Grom Comp, Charlie and Jack participated in a rare one-day training camp at The Hurley Surfing Australia High Performance Centre (HPC) at Casuarina in NSW, a 15-minute drive from the Gold Coast. Cheryl Mahoney who travelled with her son Charlie, said it was a wonderful opportunity for the boys to be pitted against the world’s best juniors and take in the Surfing Australia HPC experience. “We are definitely proud of the opportunity and the effort (for both Charlie and Jack),” Cheryl told the Voice. Local shaper Simon Forward, who runs 4D Surfboards in Ocean Grove, shaped high performance boards for the pair before they departed. “Both had pretty new boards, so they tested them a little bit before they had gone,” said Forward, who shapes boards for Jack’s younger brother Max. “Jack took one new fresh (board) that he had never rode, but he is riding that one actually and it goes pretty good. Late June was busy for Forward, he designed and shaped a board for Jack to compete at the Occy’s Grom Comp, less than seven days before he left. “We got Jack’s board out in a week ready for him to take away – I had to get that one done pretty quick actually,” Forward laughed. Jack is a grade six student at Our Lady Star of the Sea Catholic Primary School in Ocean Grove, while Charlie, an ex-pupil at Our Lady Star of the Sea Catholic Primary School, is in year eight at St Ignatius College in Drysdale. In other developments, former Ocean Grove SLSC Nipper and Barwon Head surfer Ellie Harrison was a finalist in the 14 and Under Girls Occy Grom Comp.